The chief executive of bookmakers Ladbrokes has hit back at criticism from some Scottish managers about the practice of offering odds on which boss might be next for the sack. Jim Mullen has written to Scottish League Managers Association head Alex Smith after he described it as "undignified and unfair". Ladbrokes is the main sponsor of the Scottish Professional Football League. Smith intends to take the matter up with league executives soon. In his letter, Mullen says the practice is "neither cruel nor insensitive, it's life". In the correspondence, which has been seen by BBC Scotland, Mullen also insists they have no intention of reviewing their betting procedures in light of the criticism. "We have been offering topical markets on the sporting issues that our customers are interested in for well over a hundred years," he claimed. "We plan to carry on doing this for the next hundred years and beyond. "I know that with high-profile jobs comes high-octane pressure and lots of speculation." And at the end of the letter he quipped that he would happily be on the receiving end. He wrote: "If and when somebody next opens a book on the Ladbrokes management, I'll probably have a chuckle, grit my teeth and try to upset the odds." 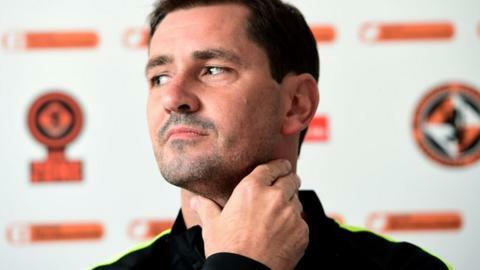 It comes less than 24 hours after Jackie McNamara was told his time as manager of Dundee United was up, following defeat to St Johnstone. Ladbrokes signed a two-year sponsorship deal with the SPFL in May. The deal is understood to be worth about £4m.